Passionate chess players always carry a chess board with them when travelling to replay games or to analyze variations and positions. 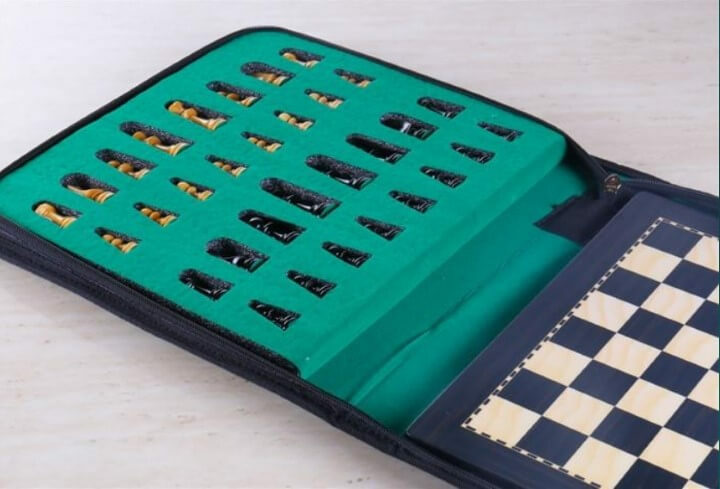 Get a complete package that combines a chess set and case. The case provides a chess board for playing on top and a storage underneath for the chess pieces. Various storage solutions for your chess set are available like simple wood boxes for storing pieces and cases with a board on top and drawers below. Use chess bags for plastic chess sets, a rollup chess board, and a clock. This shop offers a wide assortment of beautiful wood cases including cases with drawers, folding cases, cases combining backgammon with chess, and lift-top cases. The chess store below is one of my favorite chess online stores. It simply offers beautiful chess products. See for yourself. You will find travel chess sets, storage boxes, chess bags, portable travel chess computers and much more. You find beautiful Book Shaped Magnetic Travel Chess Sets where you can turn the board upside down and the pieces will not move! Get your travel chess set from the chess store below!